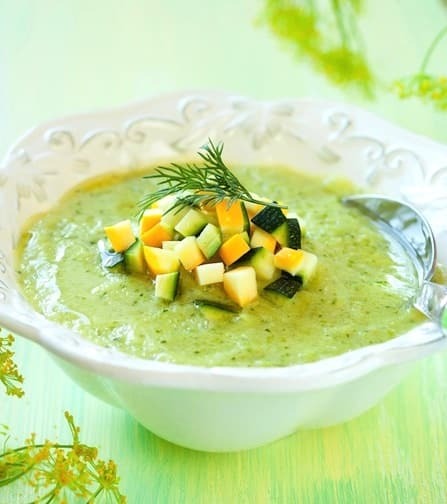 This tasty, creamy zucchini soup easy to prepare. Use smaller zucchini, as they’re more flavorful than large ones. 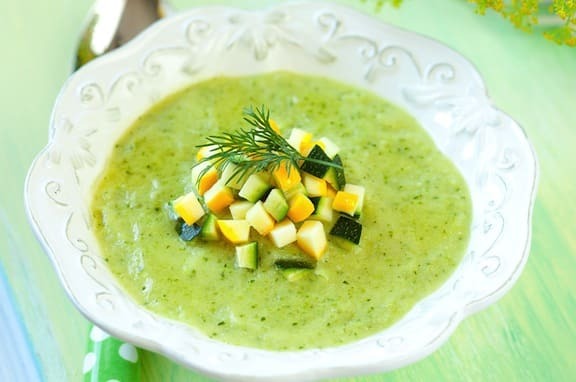 It’s a perfect soup for late summer, when zucchini are in abundance. This is good served hot or chilled. Heat the oil in a soup pot. Add the onion and sauté over medium heat until golden. Add the garlic and sauté for another minute or so. Add the zucchini and continue to sauté, stirring occasionally, about 5 to 7 minutes. Add the broth and bring to a simmer. Cover and simmer gently until the zucchini is tender, about 5 minutes. Add the silken tofu or beans to the soup pot. 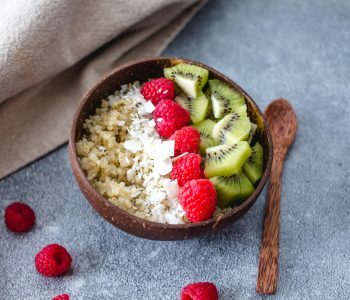 If you have an immersion blender, simply insert the immersion blender into the pot and process until the mixture is as smooth as you’d like; you can leave a little texture if you prefer. If you’re going to puree this in a food processor or blender, transfer the solids from the soup pot (in batches if need be) and puree until smooth or leave a bit of texture. Transfer back to the soup pot. Stir in the dill and lemon juice and season with salt and pepper. If time allows, cover and let stand off the heat for an hour or so before serving. Adjust the consistency with a little water if too thick, then adjust the seasonings. Heat through as needed, reheat slowly without boiling. Or, if you’d like to serve chilled, let the soup cool to room temperature, then refrigerate until chilled. For the garnish, steam the reserved zucchini plus the yellow squash in a small saucepan with just enough water to keep the pan moist, just until tender-crisp. Top each serving of soup with a spoonful or two of this mixture, along with a sprig or two of fresh dill. 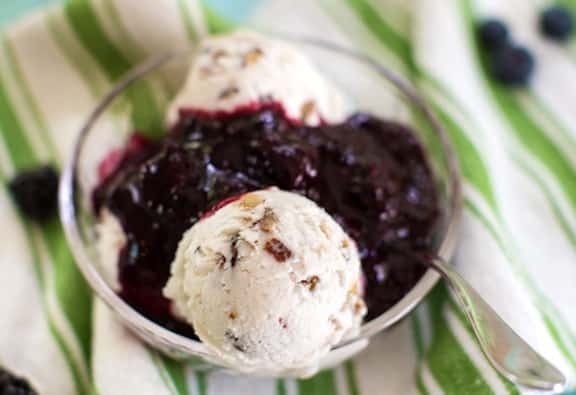 I have all the ingredients for this recipe, so I’m definitely making this today! Thanks Nava. Smaller zucchini more flavourful than larger ones?? Have you ever eaten a big zucchini? Same taste if not better. Zucchini that has been sitting on the plant for too long will get a thick dark green skin. It could be small or large and it won’t tast as good as a lighter green, fresh zucchini of any size. Again, size does not determine taste. Thanks for your input June. I’ve come to agree with you — some years ago, really big zucchini were full of seeds and flavorless. But now some zucchini are meant to grow large and I’ve had some recently that were quite flavorful.